Your company logo on all advertising, website, social media, e-blasts, printed materials and prominently displayed on our projection screen; Recognition from the stage during the event; 10 admissions in VIP Seating and VIP wine at your table; Preferred parking for you and your guests. Please email your current logo to jdehaven@scv-seniorcenter.org as soon as possible. Your company logo on all advertising, website, social media, e-blasts, printed materials and displayed on our projection screen; 10 admissions in VIP Seating; (4) wine bottles at your table; Prominent table placement; Recognition from stage during event. Please email your current logo to jdehaven@scv-seniorcenter.org as soon as possible. Your company logo on all advertising, website, social media, e-blasts, printed materials and displayed on our projection screen; 10 admissions; (3) wine bottles at your table; Recognition from stage during event. Please email your current logo to jdehaven@scv-seniorcenter.org as soon as possible. Your company logo on all advertising, website, social media, e-blasts, printed materials and displayed on our projection screen; 10 admissions; (2) wine bottles at your table; Recognition from stage during event. 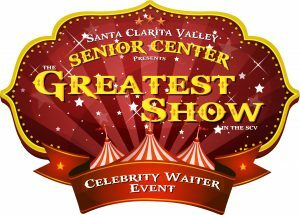 Please email your current logo to jdehaven@scv-seniorcenter.org as soon as possible.